Accord floor vents in the Charleston design have an organic, floral design that will enrich any home decor. The satin nickel register has a tarnish and corrosion resistant finish. 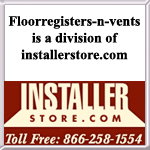 Each decorative floor vent comes standard with a rust-proof plastic damper that allows for air control. 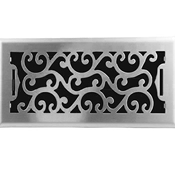 The steel core faceplate of this Charleston floor register makes the vent durable enough to hold up to 200 pounds. This satin nickel register is available in sizes 4x10, 4x12, 4x14 and 6x10. 61-0901 4 x 10 5.25" x 11.5"
61-0902 4 x 12 5.25" x 13.5"
61-0903 4 x 14 5.25" x 15.5"
61-0904 6 x 10 7.5" x 11.5"
This attractive Charleston floor register design is also available in the finishes Matte Black, Oil Rubbed Bronze, Polished Brass and Antique Brass.